After giving birth, many things were on my new-mom mind. I questioned if my baby was getting enough to eat, breathing safely and feeling loved, wondered if sleep would ever again last more than a couple of hours and marveled that such a tiny body could produce such a large pile of dirty diapers in one day. With all the care that a newborn requires, it can be easy to overlook how important it is that new moms take steps to care for themselves during the postpartum time. 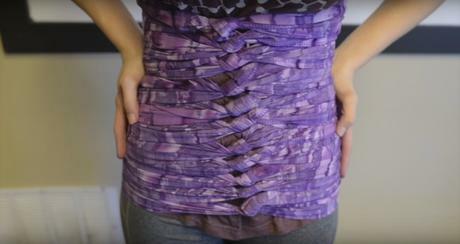 Bengkung belly binding is one way to do just that. This traditional Malaysian technique uses soft fabric wrapped around a new mom’s abdominal area to provide support and comfort. It also encourages the mother to slow down, rest and allow their body to recover from the huge accomplishment of pregnancy and childbirth. Want to know more? Here is some information to get you started. What Makes the Bengkung Binding Method Unique? The Bengkung method of belly binding is the process of snugly twisting and wrapping a long strip of fabric around a new mom’s torso from the top of the hip bone to just under the ribs. The wrap is intended to be worn next to the skin under clothing. When the binding wrap is positioned correctly, it doesn’t get in the way of breastfeeding or using the restroom, which are two activities a new mom usually does many times every day. Soft, thin materials like muslin, silk or cotton are typically used for binding. Wraps can be anywhere from eight to 17 yards in length, but ones that are 12 to 15 yards long are most commonly used. Bonus points if your partner can also learn how to properly wrap and help you with it every day! During pregnancy, a woman’s body undergoes some pretty massive changes as it becomes home to a brand-new and rapidly growing little human. The mother’s organs shift positions, the skin stretches beyond imagination and pelvic ligaments loosen to allow the baby to pass through, just to name a few. Bengkung binding provides some much-needed extra support to the abdominal area and the gentle compression can help stretched-out muscles return to a better tone sooner. The snug binding also helps organs move back to their normal positions and encourages the hip ligaments to re-tighten. The snug wrapping may shift or become a little uncomfortable if the mother moves around a lot, which might seem inconvenient to some women. However, this mild restriction of motion is actually a good thing that can encourage new moms to rest and allow themselves the time their bodies need to recover. Binding also helps a new mom develop the habit of using good posture, especially while nursing. Finally, most women report that Bengkung binding just plain feels really good and is a great way to care for yourself while you care for your newborn. As with any therapeutic process, you should always consult either your OB-GYN or primary-care physician and get the OK before you begin belly binding. The most common recommendation for starting Bengkung binding is about five days postpartum for a vaginal delivery. After C-section deliveries, the surgical incision needs time to heal, and belly binding can typically start about five to six weeks postpartum. In traditional Malaysian culture, belly binding continues for about 40 days after delivery. Bengkung belly binding is most effective during the first several weeks after delivery as the recently-stretched skin and muscles respond best to the gentle compression. Belly binding can still be started at any time up to about two years after childbirth, but the effects will be less pronounced. Belly binding girdles and elastic wraps are also on the market, so what makes Bengkung belly binding so special? There are several advantages to the Bengkung method, actually. The biggest benefit is probably the totally customized fit that Bengkung binding provides. Each woman has a unique shape and the wrapping process tailors the fit accordingly. Some modern belly binding products only cover the stomach area and aim to make a new mom’s waist smaller. These can sometimes be referred to as waist trainers and this type of belly binding may cause more harm than good. On the other hand, Bengkung wrapping is a more holistic method. By supporting the entire torso from the hip area to the ribs, the goal of Bengkung binding is to provide comfort and gently help guide a postpartum body back to a more normal state, not to make a new mom lose the “baby weight”. Bengkung-style wraps are available for purchase from midwives or doulas that offer wrapping lessons and also online from either large retailers or artisan marketplaces. Prices vary according to the style of wrap you choose. Binding wraps can be either solid neutral colors or dyed. Hand-dyed wraps come in a wide variety of gorgeous colors and patterns that seriously look like works of art. If you are looking for a good wrap and you need a recommendation, I will suggest you check these two Etsy buyers (The Art Of Wellness & The Barefoot Momma), I can’t believe how beautiful some of these pieces are! Neutral colors like white or cream may be a better choice if you prefer your wrap to be less noticeable under other clothing or if you would like to dye it yourself. Photo & Video credits: Carolyn Reece, Blessed Birth, Header photo from Eden’s Promise.